These are the sort of delicious biscuits I remember as a child, only more so. (Though probably not as good.) Serve with tea, or after dinner with coffee. Nobody ever said cheese was compulsory! Beat butter, sugar and orange rind until light and fluffy. Stir in flours and, using a wooden spoon, mix until combined. Knead gently on a lightly floured surface until smooth. Roll walnut-size pieces of dough into balls, place on greased baking trays and flatten with the back of a fork. Bake at 180C for 10 – 15 minutes or until crisp and golden. Stand for 5 minutes before transferring to a wire rack to cool. For passionfruit butter, beat butter until pale and creamy, add half the sugar and beat until well combined. Add passionfruit and remaining sugar and beat until well combined and fluffy. 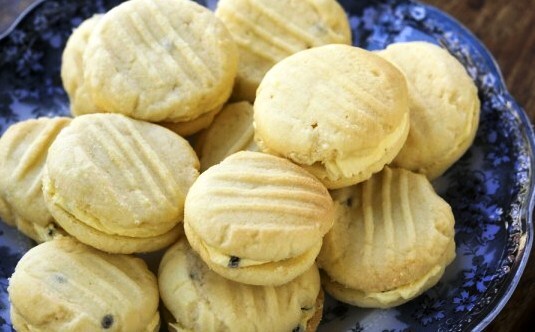 Spread a small amount of passionfruit butter onto half the biscuits, then top with the remaining biscuits. these look amazing ! I just have to make them ! Oh I love passionfruit so this can only be good! can’t beat it really! thanks for commenting!